This article offers an in-depth look at the state of B2B SaaS sales in 2015. Utilizing statistics from several major reports, we dissect the most important trends in B2B SaaS sales and marketing efforts. In 2015, the SaaS industry will continue to grow at an enormous rate. Software-as-a-Service is currently a multi-billion dollar industry, with a growing number of publicly-traded companies, private companies looking to IPO, and fast-rising startups. The purpose of this report: Figure out what trends are taking place within the sales and marketing sector of B2B SaaS. We looked to reports from The Bridge Group, TOPO, AAISP, and ZS and Reality Works to compile an aggregated, comprehensive outlook on the state of B2B SaaS Sales. 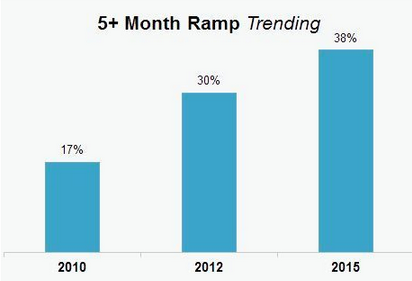 Trends in Hiring and Onboarding. 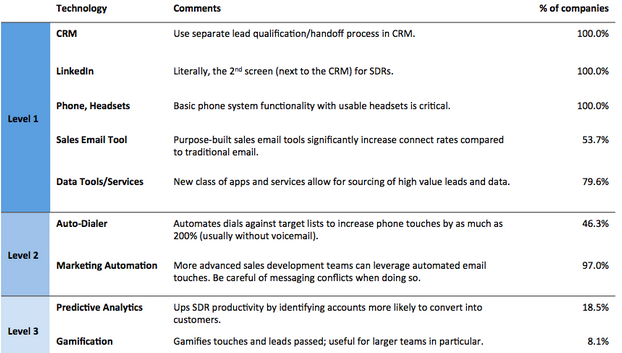 Inside Sales vs. Outside Sales. To compile this report, we sourced information from four key sources, which we’ll credit here. Are all worth a look and delve deeply into either SaaS-specific trends, Inside Sales trends, or Technology Sales trends. Outside In: The Rise of the Inside Sales Team. ZS and Reality Works. 2015 SaaS Inside Sales Survey Report. The Bridge Group. 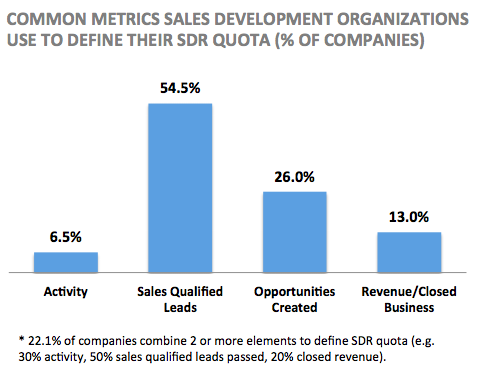 The Sales Development Benchmark Report. TOPO. 15 Inside Sales Statistics from AAISP’s 2015 Front Lines Conference. Heinz Marketing. To ensure proper credit is given where needed, you can find links to the source for each data point listed within the text. 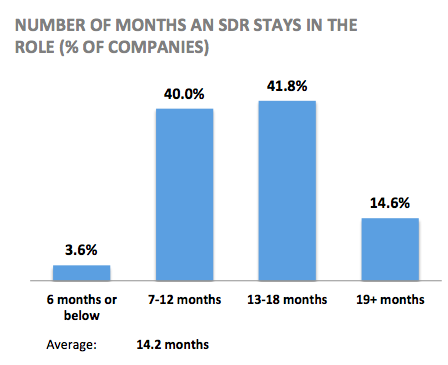 Inside Sales continues to be the preferred strategy of an increasing number of B2B SaaS companies in 2015. That extends to the larger enterprise tech companies as well with, 40 percent planning to increase their Inside Sales headcount by 2016. Currently, for tech companies who are using Inside Sales, the turnover rate sits at 19 percent. Outside In: The Rise of the Inside Sales Team. 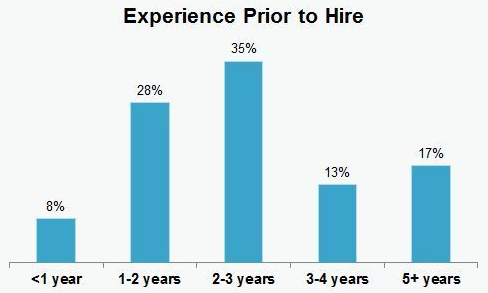 As the demand for Inside Sales reps has risen, however, the average length of experience for new hires has remained steady, at about 2.6 years, almost identical to what it was 5 years ago. 2015 SaaS Inside Sales Survey Report. The Bridge Group. 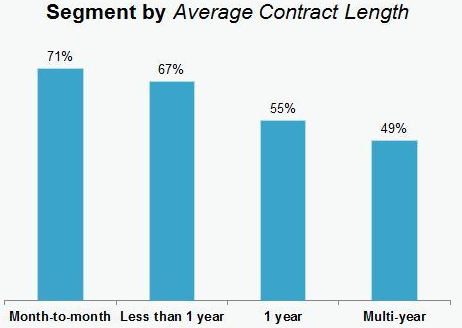 The Bridge Group astutely notes that, as the average annual contract value for a sales team rises, so does average ramp time and length of prior experience required for new hires. 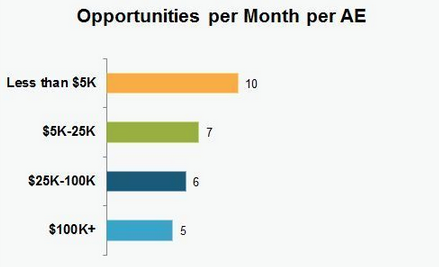 The industry average currently sits at 5.3 months (up from 4.2 months in 2010). 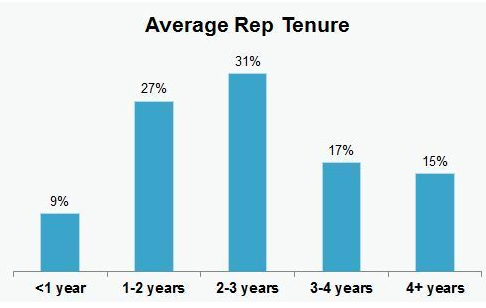 What’s also interesting is that, as ACV rises, so does average rep tenure, which currently is 2.5 years. 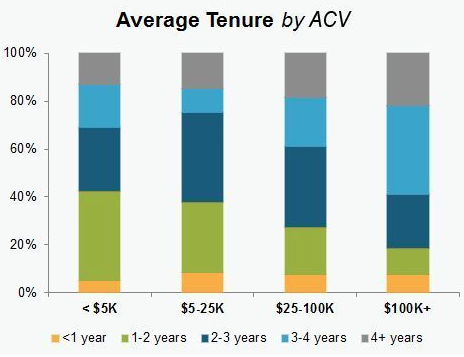 Sales reps at companies with higher ACVs also experienced more months at full productivity (defined as Tenure minus RAMP). 2015 SaaS Inside Sales Survey Report. The Bridge Group. There is a strong disparity in the sales models of enterprise companies and Mid-Market and SMBs. At large tech companies, Inside Sales currently comprise just 10 percent of sales, in contrast to 40 percent at smaller companies and startups. In 90 percent of tech companies making over $1 Billion in revenue, however, inside sales teams sell to new and existing customers, with 80 percent sharing coverage of accounts with the field. Outside In: The Rise of the Inside Sales Team. Likewise, Pacific Crest found that “37% of high-growth companies use inside sales as primary sales strategy (vs. 27% for field sales, 23% for internet sales, 8% for channel sales).” 15 Inside Sales Statistics from AAISP’s 2015 Front Lines Conference. “1. Increased margin pressure. 2. B2B buyers becoming more comfortable using the web, social media and email to make buying decisions. 3. Video conferencing and collaborative tech create customer intimacy without face-to-face meetings.” Outside In: The Rise of the Inside Sales Team. 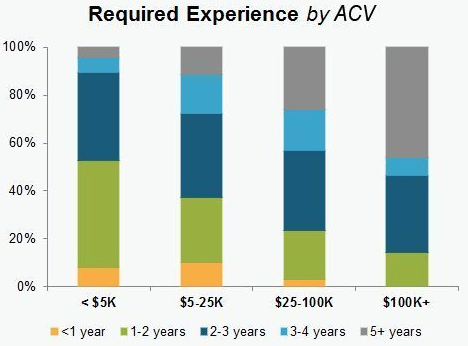 The first finding above aligns with a finding by PointClear shared February 2015 AA-ISP Conference: The average outside sales call costs $308, while the average inside sales call costs $50. 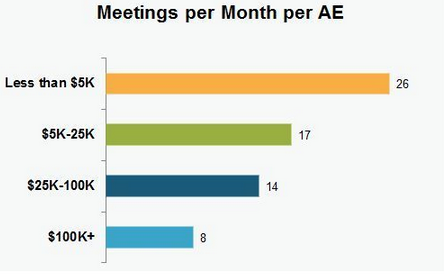 15 Inside Sales Statistics from AAISP’s 2015 Front Lines Conference. Within the SaaS industry, segmentation of the sales team (hearkening back to the Predictable Revenue model) is a preferred method of structuring one’s sales force. 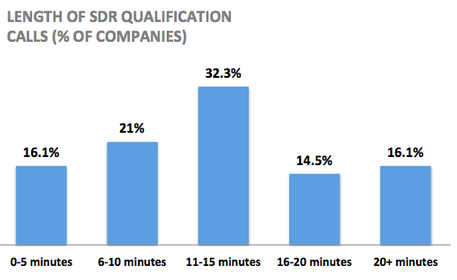 According to the Bridge Group, “nearly six out of ten companies front-end their closing reps with an SDR team. 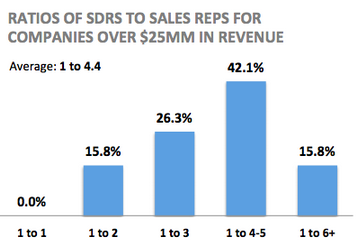 Excluding companies below $5M in revenue, that number rises to 67%.” 2015 SaaS Inside Sales Survey Report. The Bridge Group. 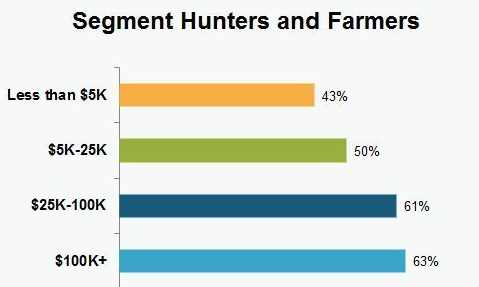 The Bridge Group also found that nearly half of all SaaS companies completely segment their sales teams into two types: Hunters (Account Executives, responsible for closing new business) and Farmers (SDRs, responsible for sourcing potential new business). 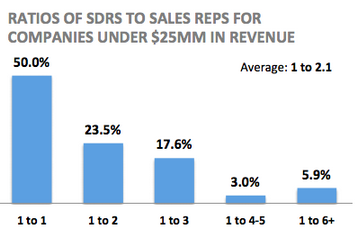 In SaaS companies making below $5M in revenue, the percentage segmenting rises to 58%. 2015 SaaS Inside Sales Survey Report. The Bridge Group. The Bridge Group deduced two factors to be highly correlated with the decision to segment: the length and value of the average contract. “The higher the ACV, the more likely companies are to keep their closing reps focused exclusively on new logo acquisition. 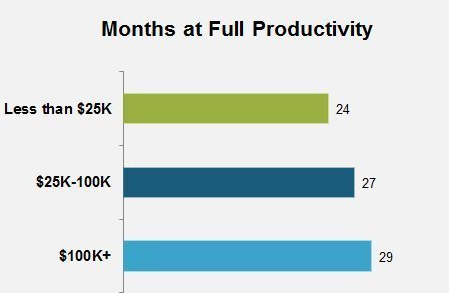 The shorter the new contract length (e.g., month-to-month), the greater the likelihood of a dedicated farming team.” 2015 SaaS Inside Sales Survey Report. The Bridge Group. 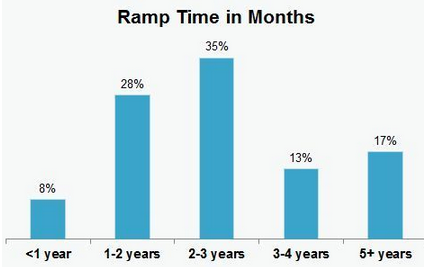 For anyone familiar with Mark Leslie’s model of the “Sales Learning Curve,” these findings make intuitive sense. 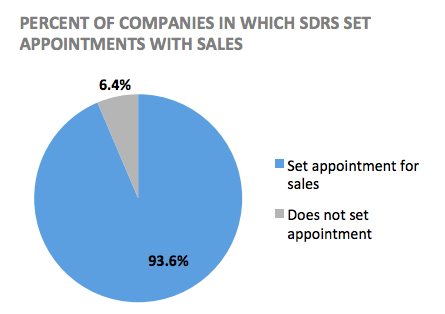 Large, lengthy contracts take longer to sign and more buy-in from the purchaser — whereas shorter, cheaper contracts take less buy-in and are more apt to begin their transition through the sales funnel with an SDR. 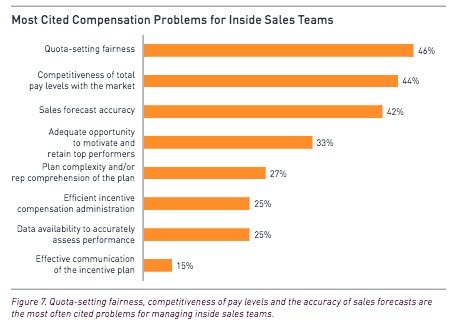 The compensation structure for B2B SaaS sales teams varies largely based on the size of the organization, the nature of the contracts its acquiring, the experience of the personnel, and the geographic location of the company. Taking a thousand foot view, average SaaS Inside Sales compensation hit a record high in 2015, continuing five consecutive years of growth. The Bridge Group discerned an average base salary of $60K and a 50:50 base:variable split, meaning that the on-target earnings of the average SaaS Inside Sales rep equated to $118K per year. 2015 SaaS Inside Sales Survey Report. The Bridge Group. According to ZS and Reality Works, 95 percent of small tech companies use a commission structure, while 60 percent of large tech organizations use quota-based compensation. 79 percent of small tech companies also factor quota into their pay scale, and in general smaller companies also provide greater rewards to their best performers. Outside In: The Rise of the Inside Sales Team. 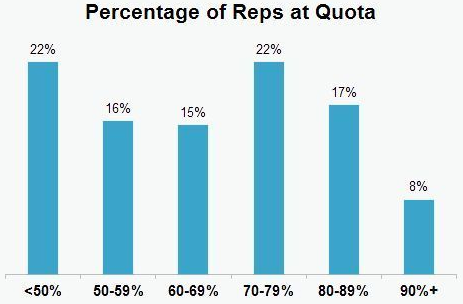 In terms of quota attainment, the Bridge Group found that 67% of SaaS Inside Sales reps are achieving quota. 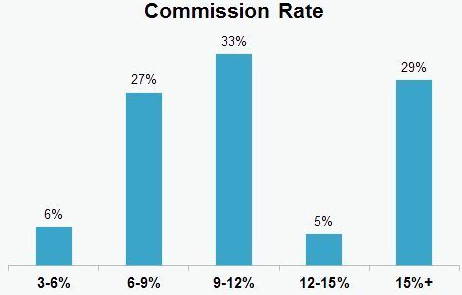 In terms of how they pay reps per contract acquired, SaaS companies are offering a 10.1% average commission rate for new business, with the median 66% of companies paying between 6% and 12% of annual contract value. 2015 SaaS Inside Sales Survey Report. The Bridge Group. How are B2B SaaS companies hitting their numbers in 2015? There are some very good numbers out there that can give you an idea. At a general level, the more established and regimented an inside sales process, the more likely the team following it is to attain quota. Echoing an article just published by the Harvard Business Review, Velocify found that automated & enforced sales processes generate 88% quota attainment (vs. 78% with merely “well documented” processes). 15 Inside Sales Statistics from AAISP’s 2015 Front Lines Conference. 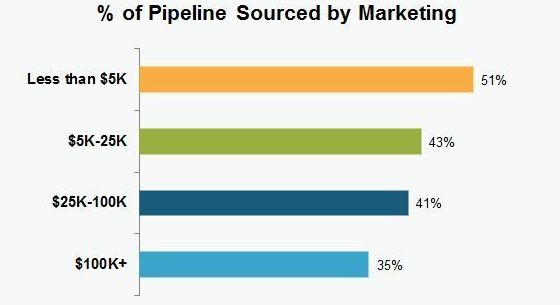 According to the Bridge Group, inbound marketing’s role in generating new leads continues to be prevalent — on average, 44% of inside sales pipeline comes from marketing. 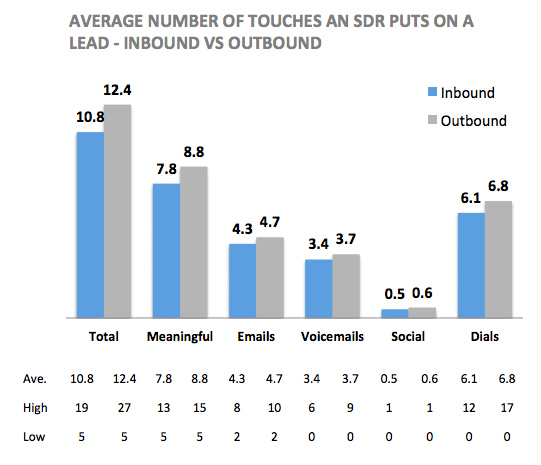 That being said, SaaS companies utilizing Inside Sales are, on the whole, relying less on marketing than they were in previous years — as that number constitutes a steep drop off from 2012, when 57% of Inside Sales pipeline came from inbound marketing. 2015 SaaS Inside Sales Survey Report. The Bridge Group. 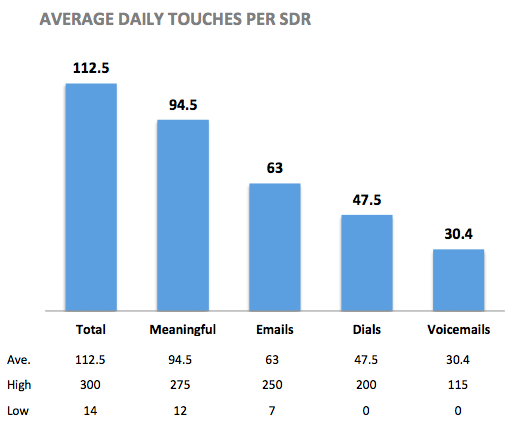 Not that SaaS Inside Sales teams are hitting the phones harder, either. 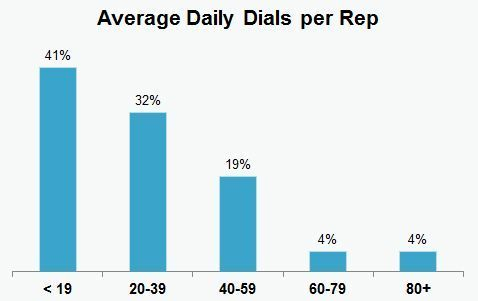 Cold calling also remains on a downswing, as the average number of inside sales dials are down 20% year-over-year. 15 Inside Sales Statistics from AAISP’s 2015 Front Lines Conference. Nonetheless, both cold calling and content marketing continue to play important roles in the sales process. Even if inbound marketing isn’t sourcing new leads, it’s still being used successfully to nurture and help close them, as Forrester found that 82% of buyers viewed at least 5 pieces of content from the winning vendor (Forrester).15 Inside Sales Statistics from AAISP’s 2015 Front Lines Conference. 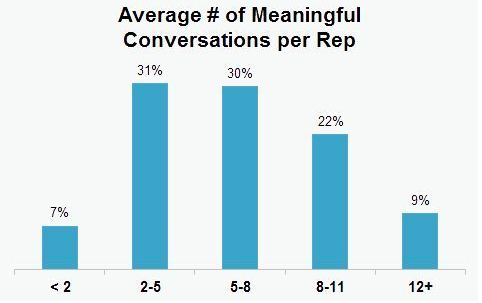 And Inside Sales reps are continuing to dial — on average 33 times per day, leading to 6.6 daily conversations. 2015 SaaS Inside Sales Survey Report. The Bridge Group. Sure enough, DiscoverOrg found that 78% of decision makers polled have taken an appointment or attended an event that came from an email or cold call, while Velocify found that 93% of converted leads are contacted by the 6th call attempt. 15 Inside Sales Statistics from AAISP’s 2015 Front Lines Conference. Two other major challenges, both directly related to one another, involve Inside Sales rep time management. According to CSO Insights, “only 33% of inside sales rep time is spent actively selling.” And a ToutApp poll finds that “71% of sales reps say they spend too much time on data entry.” 15 Inside Sales Statistics from AAISP’s 2015 Front Lines Conference. 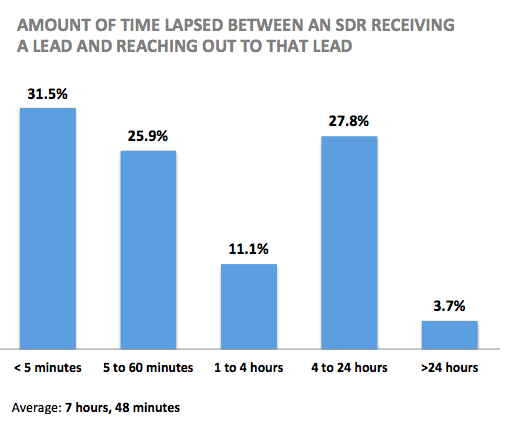 In essence, the amount of time B2B SaaS sales reps dedicate to non-revenue generating activity is far too large, and much of it is spent performing momentum-stunting, yet necessary daily activities. 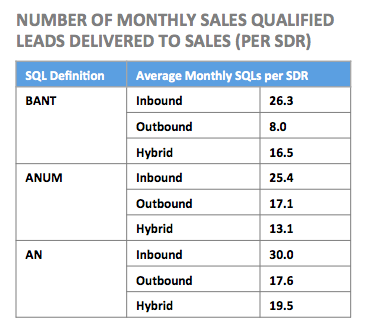 Other challenges for the B2B SaaS sales rep in 2015 come from the buyer side. According to Tellwise, the average buyer gets 100+ emails per day, opens just 23% of those emails, and clicks on a mere 2% of them. The market itself is somewhat less forgiving, with Vorsight finding that, at any given time, “only 3% of your market is actively buying. 56% are not ready, 40% are poised to begin.” 15 Inside Sales Statistics from AAISP’s 2015 Front Lines Conference. The ultimate challenge for the modern-day B2B SaaS sales rep is in engaging and convincing members of that 40% to cross the threshold and become purchasers of their technology. 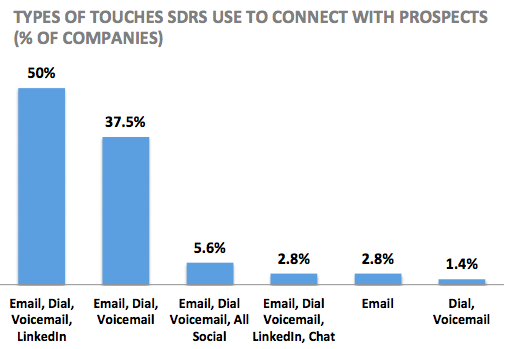 Unsurprisingly, CRM, LinkedIn, and phones remain the essentials of B2B sales force technology. Marketing automation is almost at full market maturity, while data tools and sales email tools are coming on strong. The state of B2B SaaS Sales has evolved noticeably over the last five year, with inside sales continuing to trend upwards as the preferred sales model. Better compensation, improved technologies and more ramp time have brought with them higher performance expectations and a more multi-faceted sales approach. Marketing continues to remain at a premium and are being interwoven more comprehensively throughout the sales process, rather than just the inbound stage. 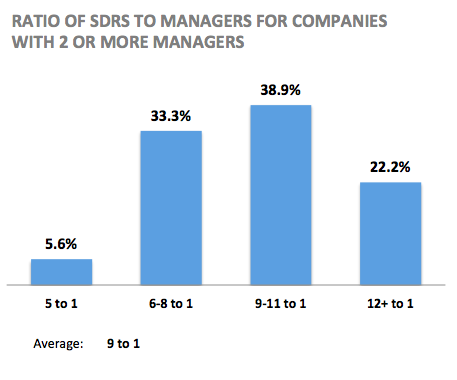 The higher the average contract value and length, the tougher the sell and the less of an impact SDRs stand to have in the sales process. Cold calling is far from dead — in fact, it continues to play a vital role in most B2B SaaS sales teams, which should be expected to continue for the foreseeable future. Every B2B SaaS company is unique, and developing a successful sales model requires examining and understanding where the company and its product fits within the B2B SaaS market in general and the market into which they are selling. Special thanks again to our sources for giving us the data needed to compile this report. We encourage you to check out each of them and their entirety. Thanks for reading, and we look forward to bringing you The State of B2B SaaS Sales report for 2016 at this same time next year.